SUMMARY: We report a case of rhabdomyolysis due to acetaminophen overdose involving the lateral pterygoid muscles bilaterally, in addition to the other muscles of the abdomen and pelvis. To the best of our knowledge, involvement of the head and neck muscles by rhabdomyolysis has not been reported previously. The isolated involvement of the lateral pterygoid muscles may be due to the presence of the surrounding pterygoid venous plexus. It is important to be aware of the imaging characteristics of rhabdomyolysis and to consider the possibility of involvement of head and neck muscles to aid in early diagnosis and avoid misinterpretation of the imaging findings. Rhabdomyolysis is defined as disintegration of skeletal muscles that causes myoglobinuria, raised creatine kinase (CK), and renal failure in severe cases.1 CT scans initially show rhabdomyolysis as areas of low attenuation within affected muscles, which may become hyperattenuated in later stages and ultimately normalize, with or without subsequent atrophy.2,3 MR imaging shows hyperintensity on T2-weighted images with avid contrast enhancement on postgadolinium T1-weighted images and may demonstrate T1 hyperintensity later in the course of the disease in some patients.4 An extensive search of the literature revealed the findings of rhabdomyolysis described in relation to the pelvic and lower extremity muscles but, to the best of our knowledge, this is the first reported case of rhabdomyolysis affecting the head and neck muscles. The lateral pterygoid muscles were selectively involved among the muscles of mastication. We propose that the intimate association of the lateral pterygoid muscles to the pterygoid venous plexus may be the cause of isolated involvement of these muscles. A 28-year-old man with long-standing psychiatric problems and suicidal ideation presented to the emergency department after a suicide attempt by ingestion of a large dose of acetaminophen. Initial clinical and laboratory examination were significant for fulminant hepatic failure, acute renal failure, hypotension, respiratory distress, raised CK, metabolic acidosis, hyperkalemia, hypocalcemia, and coagulopathy. His acetaminophen level on admission was 303 μg/mL (critical value, >40 μg/mL). The CK increased from 20–306 U/L (reference, 40–200 U/L) on hospital day 1 to 245–595 U/L on day 2. The renal failure was managed by hemodialysis, and liver transplant was performed on hospital day 3. A noncontrast CT scan of the brain was performed on hospital day 2 to rule out cerebral edema. The brain was normal but, in retrospect, the study showed lateral pterygoid muscle hypoattenuation bilaterally (Fig 1A). An MR examination of brain was performed on hospital day 16 for suspected stroke. The study was negative for stroke but showed T2 prolongation and homogenous contrast enhancement in the lateral pterygoid muscles bilaterally (Fig 1B–D). 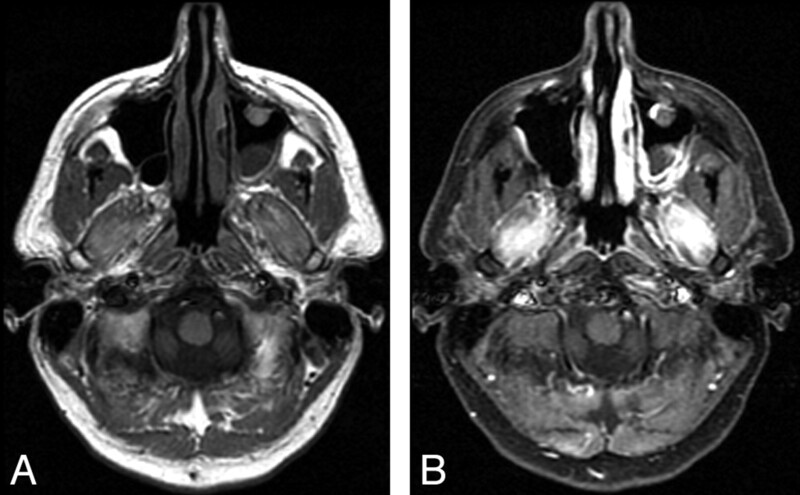 Another MR to rule out stroke on day 26 revealed similar findings, though the lateral pterygoid muscles, which were previously isointense, now demonstrated hyperintensity on precontrast T1-weighted images (Fig 2A, -B). CT (day 1) and MR (day 16) of the brain. A, CT shows enlargement and hypoattenuation in the lateral pterygoid muscles bilaterally. B-D, MR images show that the muscles are isointense on the T1-weighted image (B), hyperintense on the T2-weighted image (C), and enhanced on the postcontrast fat-suppressed T1-weighted image (D). MR study performed on day 26 shows hyperintensity on the T1-weighted image (A) and homogenous contrast enhancement on the postcontrast fat-suppressed T1-weighted image (B). T2 prolongation was also noted (data not shown). A CT scan of abdomen and pelvis was performed on day 18 to evaluate for a postoperative fluid collection. The study revealed an intra-abdominal fluid collection and subtle hyperattenuation in bilateral intercostal, gluteus, and ilio-psoas, as well as other muscles of the abdomen and pelvis. A CT scan on day 26 revealed more prominent hyperattenuation in the affected muscles (Fig 3A). This hyperattenuation in various muscle groups gradually diminished and finally resolved without any significant muscle atrophy on a follow-up CT scan done on hospital day 44 (Fig 3B). CT image of the pelvis done on day 26 (A) shows hyperattenuation in multiple muscles, which eventually resolved on the CT scan done on day 44 (B). On CT, rhabdomyolysis initially manifests as low-attenuation areas within muscles, due to edema. The literature suggests that, in some patients, intramuscular calcium deposition occurs in later stages, observed as high attenuation within muscles.2 Russ and Dillingham2 reported that CT showed high-attenuation areas in affected muscles at some point in time in 4 of 8 patients. The affected muscles were initially swollen, then calcified, and finally shrank, whereas calcification disappeared. Our patient showed similar findings with hypoattenuation in the lateral pterygoid muscles bilaterally on a CT scan performed on day 2. CT scans of the abdomen and pelvis performed on days 18 and 26 showed hyperattenuation in the intercostal, gluteus, ilio-psoas, and other pelvic muscles bilaterally that eventually resolved on the follow-up CT scan performed on day 44. 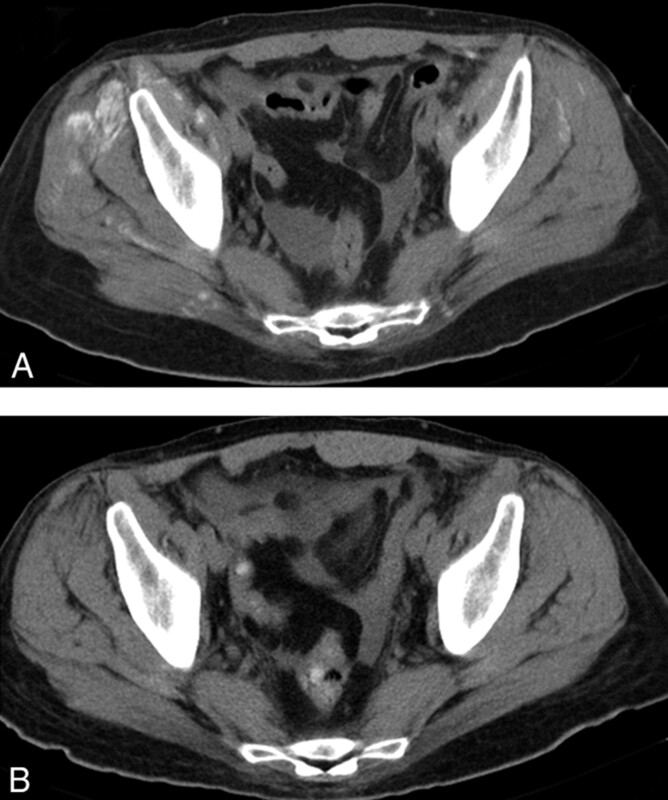 Nakahara et al3 also published a case of rhabdomyolysis involving abdominal and pelvic muscles that displayed a similar sequence of CT findings. In general, it may be reasonable to consider that patients with acute rhabdomyolysis undergo imaging studies if they have symptoms suggesting a compartment syndrome or if their disease is sufficiently extensive as to cause devastating renal damage. Later, in the chronic stage, imaging studies are useful for supporting the diagnosis, evaluating the extent of the pathology, and guiding muscle biopsies. It is suggested that CT or MR studies should be performed in patients with acute renal failure of unknown etiology. It is important that radiologists be familiar with the imaging findings of the various stages of rhabdomyolysis. Although it is more common to involve muscles of the pelvis and lower extremities, rhabdomyolysis may potentially affect any muscles, including those of the head and neck, as reported here. Accepted after revision May 24, 2007.